Would you rather read the transcript than listen to the podcast? No problem! Read the transcription below! Hello and welcome. 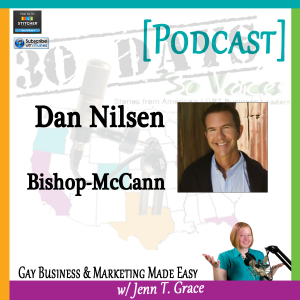 Thank you for tuning in to this special Pride Month episode of the Gay Business and Marketing Made Easy Podcast. Information about today’s guest and links mentioned in the show will be available on the website at www.JennTGrace.com/30days-30voices. If you like what you hear in this interview, please be sure to tell a friend. And now, without further ado, let’s dive into the interview.I am delighted to be talking with Dan Nilsen today. Dan is the CEO of Bishop McCann which is a brand experience agency with six locations in the United States.  In 2010, Dan was awarded with the NGLCC Wells Fargo Business Owner of the Year Award. And this recognition spawned Dan to found the Mid-America Gay and Lesbian Chamber of Commerce, recognizing that there was a need to have one in the Kansas City area. So Dan, I’ve given the listeners a really brief overview of who you are and a little bit about your company; but why don’t you tell us a little bit more about yourself, your story, and what your path looked like that led you to where you are today. Hi Jenn, thanks for having me on today. You know I actually was asked about a year ago to be the topic of a reality series because my life- where I got to today is just so interesting because it involves so many pieces, some quite entertaining actually. I was born and raised in California and went to Long Beach State, and grew up and actually married my college sweetheart, Julie, out of that. And we had three children together. I have three daughters actually, they are- my first just graduated from college, my second just turned 21. So I can’t believe that it’s been so long. I started actually in Big Pharma out of college, so I was a pharmaceutical sales rep for a company like- called Marion Laboratories back in ’85, and left school to work for them and ran sort of the LA market for that. I was 24 at the time and the average age of my district at the time was about 32. So that was quite a challenge to kind of move in, try to quickly learn all the things that you didn’t know about managing people. I remember one of my first sort of a ride-along where you ride with one of your reps, she was talking about getting a divorce and I didn’t know the first thing about what I could say that could possibly give her any advice. But I learned at that point I was supposed to be a good listener, and just share as much as I could about my reps with each other and I think was one of the ways that I certainly got to in terms of working with people and understanding the differences in people. So then in about 1992 I moved to Kansas City to the home office at Marion and then in ’94 I was given probably one of the biggest opportunities that I’ve ever had in my life and that was to leave the company. So I left at that time the company, and founded Bishop McCann. So Bishop McCann is a- we call it a brand experiences agency, it’s actually a company that does live events. So we do pretty much everything from soup to nuts when it comes to a live event. And a live even being like a business meeting; so like for instance a national sales meeting where we would bring together a large group of sales representatives to one location and they would spend let’s say five days doing meetings and break-outs and team building activities. We’d have evening parties and dinners and concerts and all kinds of things; and we basically do everything from the minute they register at home, we actually handle their airline travel, we handle all their ground transportation, we have staff that are there on site so for every fifty attendees that are there we actually have one of our staff handling them with a very, very high touch approach to make them feel welcome and at home. And then we handle everything from inside the meeting room; so when they walk in we handle all the stage production, we handle all the bells and whistles when it comes to making them feel good about the company that they work for. And then like I said we handle all the food and beverage events and things like that and we deliver them safely home as well. So we are as you mentioned, Jenn, in different cities; we typically locate ourselves where our clients are and we have 65 full time employees, probably about 125 part time associates that travel all over to our programs and work our programs for us, and we’ve been now around- we’re in our 17th year of business. Wow, that’s really exciting. Seventeen years; that’s definitely a feather in your hat since you know, there’s been so many upswings and downswings with our economy. So to see that you’re continuing to grow is pretty awesome. Thank you. It’s quite surprising to sit here today and look how far we’ve come. I would have never been able to tell you that twenty years ago. That’s really cool. And so you’ve already gotten to some really good information, and I typically like to start off the interview with some sort of light-hearted question, just to kind of get you in the right mindset. And what I like to ask is if you would share with us some sort of fun fact, or something that may be random about yourself that very few people know or would expect from you. The favorite parts of my growing up in California was Disneyland. We would go all the time and in fact I remember driving to Disneyland, the first one would win is the person that saw the Matterhorn the first time. And so I was just fascinated with the quality of the experience and just everything about it. And one of the shows that I thought was most fascinating was Fantasmic. It was a show that they had in about 1992 where it featured sort of fireworks, live actors, water effects, pyro and everything. And I thought, ‘That’s what I want to do, I want to be somebody who creates these shows like this.’ And so they called that the Disney Imagineer. So I would be so happy if I was a Disney Imagineer right now. That’s funny, and that’s really interesting how it really translates into what your business is. It really does because that’s exactly what we do and I had no idea. So when we talk about things that come up with the college, like I imagine very few of us are experiencing the major that we actually started out with in college. But if you look back when you’re very young I bet there’s things that can correlate to what you’re doing now. They’re our dreams, I think. So many of us really have to listen to our dreams. Yeah, that’s a really good point. And it actually kind of goes into the next two questions I have for you, and the first one is around an ‘ah-ha’ moment. And was there any particular moment in time, or maybe it was a series of moments where you just knew that this is what you were supposed to be doing? Yeah, actually it was the day that I got laid off from big corporate. Probably, you know I worked for this company for ten years, I thought it was the company, back then it was sort of what you did. You know you just worked for a company for a long time and you try to put away as much money that you could and then you retire from that company; and that was kind of the way I was taught, that’s what my father did, it’s what my family did. And but my ‘ah-ha’ moment was getting caught up into the whole corporate kind of mergers and acquisitions thing and I was actually part of the lay-off team for four different times that our company went through a merger. And on the last round of the very last series of lay-offs, I actually was given the opportunity to leave. And to be given that kind of news, you know I was terrified. But at the same time, I left that office and I had probably the biggest rush of adrenaline that I’ve ever had in my life because I finally was able to realize that I could do anything I wanted to do, and I wasn’t limited. At the time severance packages were big, and so I was given a year’s severance package to be able to figure out exactly what I wanted to do, and that’s what really became the best day of my life. Absolutely, especially when you have that little bit of a cushion to really allow yourself that time to think things through and really figure out where your passion lies. But what I want to talk about that for a minute, because I don’t think you need that much money to start a business. I blew the money that we had saved that first year. Because I left a company where I was making pretty significant money. I was making over $100,000 at the time, and when I left I was making a fraction of what I was making there. So I blew through even our profit sharing if you can believe it, I blew through that profit sharing and just didn’t have a real responsible way of looking at finances. So when I started the business, I had absolutely nothing. All I had was the passion and the creativity and the dreams. And that’s definitely worth any amount of money I would imagine. That is really interesting. And this is an absolute perfect segway into my next question which is around inspiration and motivation. So you’re clearly passionate about what you do, but is there any particular source of inspiration that keeps you motivated to continue doing this every day? I think it’s the people that I surround myself with. I find myself most creative when I’m with someone. You know, a lot of us are different. Some people find our energy from being alone, or that, but I find that sometimes I even just have somebody sit with me and listen to me and give me just some feedback on things that I’ve already figured out for myself. And it may take five or ten minutes, but for me it’s the people that I surround myself with and I’ll talk about that a little bit later too, in terms of some of the things that I think that has helped me be as successful as we’ve been. That’s really interesting, it kind of goes to that whole introvert and extrovert thing and where you get your motivation and your energy from and all that great stuff. And that was actually one of the reasons why I had started my podcast. Not this particular project for June, but when I started it in January it’s because I just got so much motivation and energy from listening to other people’s stories. And I was thinking it’s incredible the amount of information that people are sharing that nobody just- there’s no one there to ask them, ‘How did you get started? Where have you been?’ And when I started asking these people questions it seemed like everyone should know this information, which is kind of how everything came about. So I can totally relate to what you’re saying. So the next question I have is switching gears just a little bit and that’s around business advice. So is there any particular piece of business advice that you’ve been given in the past that’s just kind of one of those guiding principles for you? Definitely. And the first one was to surround yourself with people that are much better than you are at things that you’re not good at. I think at first you have to identify those things, you know what are you good at? Take a sheet of paper and write down all the things you’re good at. For a lot of people, the numbers you’re real good at. I’m not good at all with accounting, I can’t even balance a checkbook. So I understand the need to have somebody be around me that can protect our finances. And there was even a point five years in the business where I found a dishonest situation, one of our associates was taking money out of the company; because I wasn’t minding the business as closely as I could be. And so that was a lesson that I learned right then. I also learned to write contracts before I lift a finger in our business. I remember I was doing a video for a client and it was just a handshake sort of thing, but I faxed – at that time you know we used fax machines to communicate – and I faxed the estimate and after the video was done I got this phone call and he said, ‘I can’t believe that you would charge $50,000 to do a video,’ and I said, ‘Well you signed off on the estimate.’ And he said, ‘Well I don’t remember getting it.’ So that was it, so from that moment forward I realized that having somebody to help me write contracts and getting good legal advice was very, very important; something that I could never do for myself. So I think surrounding yourself with people is very, very important. And the other thing that I learned about halfway into the business was set up an advisory board for those entrepreneurs that are listening. You know set up an advisory board with people you love and trust that love and trust you. And they’re doing it for the right reasons. I can’t tell you, my business would not be where it is today without my five trusted advisory board members. That’s really, really important and I swear by having an advisory board myself. Because like you’re saying, it’s just surrounding yourself with people who- they have a vested interest in your success, and that makes them really valuable. So if we switch to marketing for a few minutes, I have a couple of questions over here. 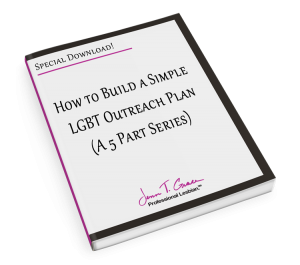 And my one question is that a lot of people who are listening to this are either LGBT business owners themselves, or they may be allies to the community who are looking to sell their goods or services to the LGBT community. And for anyone listening to this, do you have any particular piece of advice that you would give that you think would help make them successful in doing that? Yeah you know we’re asking ourselves that question a lot right now because the fact that we’re finding that this community is extremely loyal, and the data shows that such a large percentage of our population say they will do business with a company that shows us that they’re friendly to us and they believe in our values and they believe in us as human beings. I also have seen data that suggests that if a company is not friendly to the LGBT community, that we will actually make a choice to not do business with that company, and we will also tell our friends and neighbors and family not to do that. Because I think now, I think we all agree that there’s not a single person that we know has not been touched by the LGBT community, either through a friend or a family member that they know. And so I think it’s really important that you do that. But we’re just still working on that. We actually started our Gay and Lesbian Chamber of Commerce here in Kansas City, it’s called the Mid-America Gay and Lesbian Chamber of Commerce. We’re only about a year into our existence; we just celebrated it. And so the things that we’re working on is really just trying to develop programming and things that young entrepreneurs and also members of large corporations who are our corporate partners, we can grow in leadership skills. 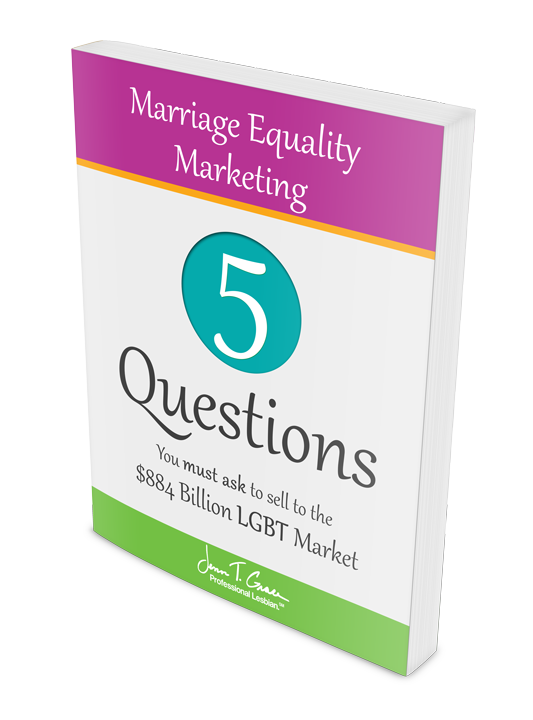 So we’re not spending as much time on marketing ourselves within the LGBT community, so it may not be the best advice for that just yet, but can you ask me that question maybe in another year? Absolutely. We’ll do a follow-up. So my next question is around being an LGBT person and have you found ways to leverage that status in a business setting, or as a business owner? That’s a good question because I’m just now getting into that. I’ve been a certified business with the National Gay and Lesbian Chamber of Commerce for about three, four years. And I’m just now seeing the benefits of that because I’m getting involved. I think had I asked for advice early on, I would have probably done that and asked for guidance as to how to sort of navigate your way through this. But I really feel now that I’m able to do that, but I can only do that because I’m involved. I sit on the supplier sub-committee for the National Gay and Lesbian Chamber of Commerce, so I’m finding that there are really great opportunities for engaging with our corporate partners. And so I’m learning about the fact that in the whole supplier diversity segment, that would be departments that in corporations that are members of the chamber specifically see the LGBT community as a minority business supplier. Basically they see us as the same as a women-owned business or a minority-owned business. And we’re looking at opportunities to where these companies actually want to do business with us. Now, being LGBT certified, being NGLCC certified, only opens that door and then from that point on forward you have to show specific key differentiators that make you let’s say better than your competitor or a company that provides good value for that corporation. So just really tapping into that I’m really excited about some of the things that are happening. That’s really exciting and you really just kind of summed up supplier diversity, I think in a really digestible way for people, so that’s great. 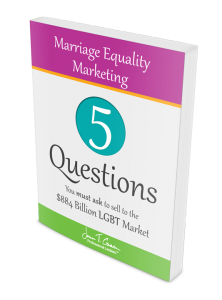 And if we went back to that question about marketing- people marketing themselves to the LGBT community, I think what you were just talking about which was getting involved; and in this case you were talking about getting involved with supplier diversity. But being the sole founder of an LGBT Chamber of Commerce that, you know right now you’re in Kansas City, but I see that you do have plans to branch out into a five state area. 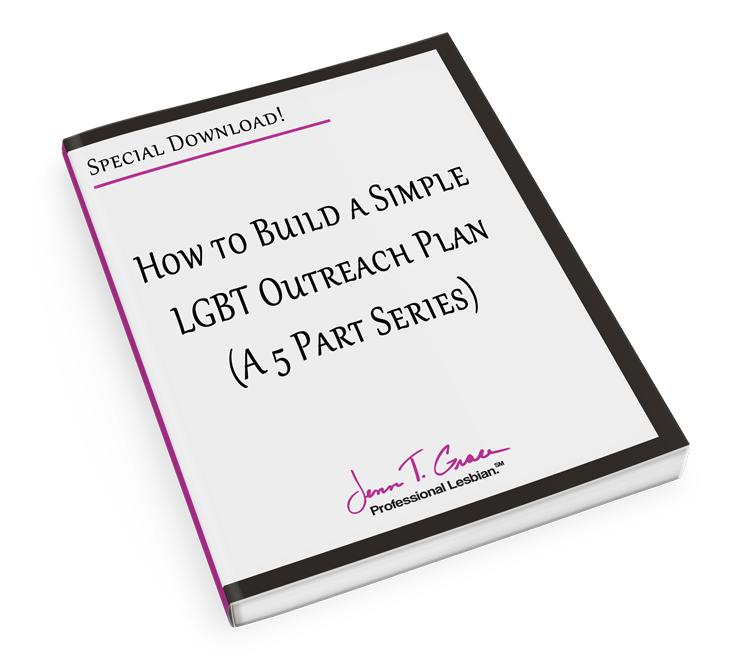 I think that anyone listening to this, telling them that if they are in your particular backyard or maybe the backyard of other chambers, that that’s a really good first step; to get yourself involved with the LGBT community and just go out and meet people within the LGBT community. It’s so exciting because a city like Kansas City, it’s kind of fun to be here because the fact that we only have one place to go but up is up, you know in terms of our place in the community. But we’ve got an overwhelming response to our chamber and I mean the mayor came to our celebration. The executive director of our greater Kansas City Chamber of Commerce came to our celebration just a few weeks ago for our one year anniversary. I can’t tell you how excited I am, and even though I’m the founder, no doubt again you surround yourself with people that are better than you are at things; I’ve done that same thing with the Chamber. I mean I can’t tell you how excited I am with all the talent and resources that we have here in Kansas City that people are just so excited about this. And we’re actually seeing an economic benefit as well, and that’s the best part about it. Absolutely. The economic impact is huge and it’s great that you’re seeing that even at your one year mark, that’s totally awesome. So I want to switch over to asking you about a business book or maybe some sort of program or tool that you use that’s really just helped you streamline the way you go about business. Is there anything in particular? Well for me it’s keeping things as simple as I can and so some of the books I think have been really helpful for me would be- one particularly, it’s not a very new book but it’s called The E-Myth, and it’s written by Michael Gerber. So if you haven’t read that it’d be a good idea to read that especially if you’re an entrepreneur. And I think the story in that book that hits home with me was a story about basically a lady who loved to make pies, and she was so good at it that a friend of hers talked her into starting her own business of baking pies. Well after about the first year or two, you know she became very, very successful at it but she got to the point where she hated smelling the pie because she was so bogged down from parts of the business that she didn’t know how to run. Like the accounting for instance, that just wasn’t her thing. She was a creative person kind of like I am. So once she realized that she needed to get help, she didn’t- it wasn’t only until then that she could actually stand the smell of a pie. So she loved to bake again; so I think that’s a good piece of advice. The other one is a book that I think a lot of us have read and that’s called Good to Great by Jim Collins. And the one thing that’s the most important, I think part of that book is to keep the right people on the bus. It’s really important that you surround yourself with people that are talented and that really believe in your dream; and if you don’t, another piece of advice that I was given – hire slow and fire fast. Now I’m a guy that leads with my heart, so it was very hard for me to do that but I have to tell you that once you get the right people on the bus, there’s no stopping you. There’s no stopping you. And when you have those people that are sort of subtractors in your lives, you have to eliminate them because they’re eventually going to really get in the way of you growing your business. I think you’re spot on with that. You’ve given so many good gems of wisdom throughout this interview already, this is totally fantastic. And the last question that I have for you is what’s exciting in your workplace right now? Is there just something that you’re over the moon excited about? Yes, there is actually. But I think it’s something that’s going to compliment my business, and that is that I’ve decided to write a book. And sort of to give you just a little bit of a preview, is that I really think America needs a refresher course on how we treat each other. Whether you’re a mother, a father, a customer, a son, a daughter or maybe a manager; I think sometimes we forget how to treat others with dignity and respect, and how much more we can get out of a relationship if we put ourselves in the shoes of that other person. I mean how often do you go about your day where you may be in an airport, and you’re witnessing somebody attacking an airline attendant sitting at the desk that’s trying to get you home, and everyone else home, because of a bad weather delay. And I’ve heard these people say, ‘Do you know who I am? Do you know how much I travel your airline? Do you know how important I am?’ Well of course they do. Everyone’s important, we’re all trying to get home. But if you treat that person with dignity and respect you’re going to get home a lot sooner, I guarantee it. You are totally right about that. I actually just recently had a customer service experience with- I don’t know if you’ve heard of the FitBit, but it’s a pedometer and I swear by this thing. And everyone I know has purchased one because I’m constantly talking about it. And it broke for some reason and it had nothing to do with me actually breaking it, it just stopped working. And I reached out to their customer service department and I was just really genuine with them in saying, ‘Hey listen I absolutely love, love, love your product. I don’t know where my receipt is, the packaging is long gone but I can tell you where I purchased it and the date I purchased it. And the customer service I got back was so warm and friendly and welcoming. And if I had approached that situation and said, ‘Listen, your product broke on me and I don’t have any of my information, what are you going to do to help me?’ I would imagine that the response probably wouldn’t have been as nice. You know, I feel like customer service people in a lot of instances, they’re kind of waiting to be come at from a combative perspective. And like you’re saying, if we just treat each other fairly or with the right amount of dignity, I feel like a lot would be better in the world. Yeah I think that since technology has become obviously more and more important and mobile technology as well, is that people – especially the younger generation – expects to get a response so much sooner than we’re actually even able. The thing that I think was important that’s really exciting is that one of my three daughters who just turned 21 told me that she’s really excited about being part of my business. So all three of my daughters have worked at the company now and then, but it’s only up to now that one has actually talked about wanting to be involved and potentially take over the business someday. And I’m excited because she wants to do it for the right reason; so she’s going about it the right way which is pretty cool. That’s so exciting, that’s one of those things that I feel like as a parent myself and my kids are just four and six now so they’re not even remotely close to having this type of vision. But it’s one of those things that for me to be able to pass down my business to one of them, I feel like that’s just one of those- you can’t lose type of scenarios. Like that’s what you dream about, and many times your children aren’t really interested in what you’re doing. It’s really awesome for you. So I want to thank you so much for taking the time out of your day. You’re clearly a very busy person. But before I let you go, I want to make sure that you let everyone know where they can find you. Thank you. Well you can email me directly at dnilsen@bishopmccann.com. You can also find us at www.bishopmccann.com if you want to read about the company. And as far as our chamber, you could go to www.maglcc.org and you can read about all the things that we’re doing with our new chamber of commerce here in Kansas City. Excellent. Every one of these interviews does have a blog post that goes with it so I’ll make sure that all of those are linked up in there as well. So thank you again, I appreciate your time and we’ll definitely stay in touch.